The Off-Broadway show that discovered young performers like Britney Spears and Natalie Portman comes to the West End! Ruthless! The Musical tickets are available now for this stage mother of a musical! Some people will do anything to get their chance at the spotlight. Tina Demark is dying, or killing rather, to be in her school play. Will a star be born or will everything go wrong? A cult classic that pokes fun at Broadway musicals like Gypsy and Mame, Ruthless! Has been winning awards and catching the attention of audiences since the 90s. This wickedly funny musical is coming to London’s Arts Theatre for a strictly limited 14 week run starting March 16th. The role of Tina has been a starting place for many girls who have gone on to become household names including Natalie Portman, Britney Spears and Laura Bell Bundy. Casting announcements are forthcoming. 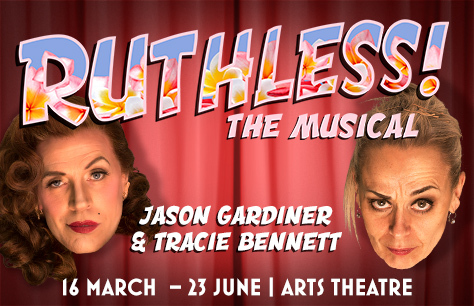 Book your Ruthless! The Musical tickets now to ensure you’ve got the best seats in the house! This is a fantastic show! The plot is exciting and the songs are entertaining and really funny. The vocal talent is exceptional and the young girl who played Tina at this performance (Fifi Bloomsbury-Khier) is a star!